What do Millennials want? Flexibility and independence top the list, according to a new study, “Millennials and the Future of Work,” from oDesk and Millennial Branding that polled nearly 2,000 people aged 19 to 30. Results? 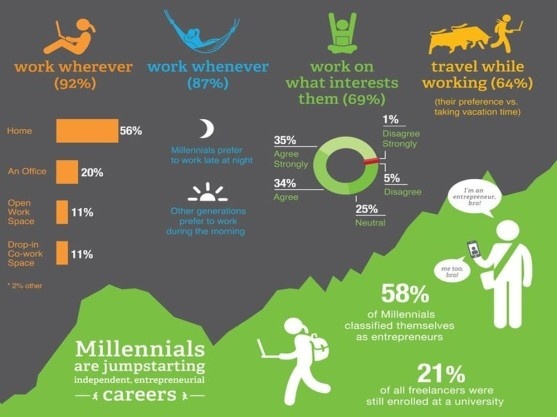 Millennial workers want freedom and the flexibility to work how they want. for ninety-percent of Millennials surveyed, being an entrepreneur means having a certain mindset, rather than starting a company. Three-fourths of them say the benefits of being an entrepreneur outweigh the downsides. Millennials hate having to follow corporate rules and climb the steps of the corporate ladder, making small businesses a natural fit for them. Since Millennials can feel entrepreneurial even as employees, businesses can take advantage of their self-starting nature by giving them projects of their own and let them run with them.